"Digging one day for fishworms, I discovered the groundnut (Apios tuberosa) on its string, the potato of the aborigines, a sort of fabulous fruit, which I had begun to doubt if I had ever dug and eaten in childhood, as I had told, and had not dreamed it. I had often since seen its crimpled red velvety blossom supported by the stems of other plants without knowing it to be the same. Cultivation has well-nigh exterminated it. It has a sweetish taste, much like that of a frost-bitten potato, and I found it better boiled than roasted. Although I enjoyed the rest of chapter 13 (all about Thoreau's firewood experiences), I think wild-crafting makes a more fun thought-question for our readers. What's your favorite wild-crafted food? When do you look for it? How do you harvest it, cook it, and/or preserve it? If we're sticking to the plant and fungal world, my favorite would have to be oyster mushrooms (and see this post, and this post). But I want to remember to check on the cattails at the right time of year to pluck their young flower stems, which one of our readers (Eric in Japan?) talked about last year in such a way that he made my mouth water. I suspect some of you would rather talk about the woodpile that Thoreau looked at "with a kind of affection", or perhaps about the former inhabitants of his forest. Feel free to comment with any thoughts you had when reading the most recent chapters, of course! If you're new to the book club, you might want to check out the thought-provoking comments on chapter 1, chapter 2, chapters 3 and 4, chapters 5 and 6, chapters 7 and 8, chapters 9 and 10, and chapters 11 and 12. We'll be discussing chapter 15 (Winter animals) and chapter 16 (The pond in winter) next Wednesday, and anyone is welcome to join in. Finally, we're nearing the home stretch of Walden, and it's time to start thinking about whether or not we want to have another book club. Gaia's Garden was in second place when we voted originally, but more recently a reader had suggested Rosemary Morrow's Earth User's Guide to Permaculture as an alternative introductory text. Or maybe we should counteract Thoreau's stilted prose with a homesteading beach read like The Bucolic Plague, Coop, The Blueberry Years, or The Dirty Life. Please leave a comment with your thoughts (including whether you're sick of our summer book club or would like it to contiue). I've enjoyed bouncing literary ideas off my readers, but don't want to pretend I'm participating in a book club if everyone else has bowed out. 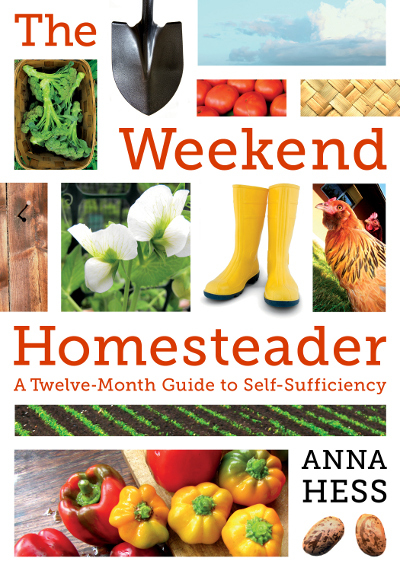 The paperback edition of Weekend Homesteader is full of fun and easy projects that guide you onto the path of self-sufficiency. Yep! That was me. The cattails were delicious. Gathering wild onions for Grandma every spring. It is one of the few remanants of Cherokee culture left in our family. We eat them with scrambled eggs yum! Phil --- What kind of wild onions do you gather from Grandma? The little ones that grow in lawns, or ramps, or something entirely different? Cactus fruit is plentiful here in north Texas. I use it mostly to make jelly with. I always have to much though and like to mix the extra with apple sauce and make fruit leathers. About the next book--I just finished The Blueberry Years this spring and I'd read it again! It was an easy read, warm and welcoming. I loved it for the same reason I love your blog, because it's about the farm and the plants, but it's about the family that grows them too, including the funny and the not funny stuff. I'll vote for anything about permaculture (cuz my sister is a permie geek), or anything that feels like a farming novel. Randy --- I've always read about prickly pear fruit, but never eaten one. I love hearing the stories from further away like this! Wild berries, but especially blueberries. They're so much better than the cultivated ones for some reason. I've never actually had one, but from the descriptions I've read and heard I think paw paws would be close up there. I had a wonderful weekend at the Firefly Gathering in North Carolina recently and did some fun stuff like making fire with sticks, processing and cooking rabbit, and learning about chestnut agroforestry as a staple food crop. There were a lot of people from Madison County, NC there and they seemed like they walked the walk. Maybe you all could talk a few of them into crossing over the border. I think they'd make great neighbors. Back in my childhood when we went to Myles Standish State Forest, my mother was so nostalgic about the first arbutus, but my great-aunt, who had remembered the women all crying when she was two and President Lincoln was shot, wanted "checkerberries" (which is regularly called wintergreen, I think). So we would solemnly pick her an orange juice glass, to bring her,because she was housebound. I realize now that these berries relieve pains, like aspirin, so maybe she wanted them not just for their beauty and taste. More even than the wild blueberries, my mother loved sweet-fern, for its lovely smell when hot in the sun, which, she said, helped her sleep at night. Gathering when I first tried out plants from Euell Gibbons' books, I most loved watercress, at Wortroot. But the wonderful apple tree, now cut down, on the way to Abrams Falls, was the equal to checkerberries, to me! I had to read a few earlier chapters, to catch up, and was really turned-off by Thoreau's account of the Irish family he took shelter with,k during a rain-storm: he calls them "bog-trotters" and I realized this is an anti-Irish labeling. (I've just finished a startling book about Lowell, Mass. and the mill-workers, and all the prejudice against the Irish: Call the Darkness Light, by Nancy Zaroulis, part of The Hera Series.) The fact that Thoreau didn't try drying his beans for his own food is strange, esp. since he did stay at Walden 2 yrs. Is it wildcrafting if it's in one's suburban yard? I've always wanted to be able to safely pick wild mushrooms, but I haven't yet managed to find a class that I could easily attend; while I've always believed that one can learn just about anything from a book, picking mushrooms is one of the few things (along with stuff like flying a jet plane or convincing a horse that it should allow one to ride it) that I think really requires hands-on learning with an expert. At the moment my main foray into "wild" foods involves picking young dandelion leaves and purslane for salads. If I'm feeling fancy, I'll also add some of the young violets that pop up in our yard every spring. I also have some antique cookbooks with recipes for dandelion wine, so I'm definitely going to try making that one of these days. When I was little, we spent a lot of time picking the wild blackberries that line the edges of the woods on my folks' property. They're small, so it takes forever to pick enough to do something. We made jam once, but most years we only got enough for a pie, plus some extra handfuls for sprinkling on cereal or in a fruit salad. My dad taught me early on the fun treat of picking mulberries (both white & red varieties) off the tree while riding the mower along our yard's treeline. My other favorite was the stand of black raspberries just beyond our yard, between the railroad and the small pond alongside it. The canes ran off and on alongside probably a 100 yard stretch, and on years with good rain, I could pick a half-gallon in about 30 minutes. I made jam a lot with these, but the best was when I made my first homemade pie: cherry & black raspberry with a lattice crust. yum! This is a memoir by a woman who singlehandedly raised apple and peaches in Ipswich, MA during The Depression. She did use pesticides. And exterminated wild bees from an attiic. Interesting because of the location and her determination. @ adrianne - I loved your story about your great aunt: I've actually run across the name "checkerberries" in books, but I never knew to what they referred. Also, how cool to have known someone who was alive so early in the 19th century! My grandfather was actually born in 1892 - he went to school on a horse-drawn "bus," could remember the day he saw the first automobile in the county and served in WWI. However, since he didn't have any children until he was in his 50s, he was really more of an age to be my great-grandfather by the time I was born; and I always had trouble convincing people that I actually knew someone who was born in the 19th century, heh! Also, in reference to prejudice against the Irish, I just wanted to share a little anecdote. Much of my heritage is British Isles, and it's commonly classified as "Scotch-Irish," because a number of my Irish ancestors migrated to Scotland in search of work. Of course, they weren't welcome there, and to this day, in some parts of Scotland, my grandmother's maiden name is used as a derogatory name (at about the same level as the "n" word in the U.S.). As my grandmother was the last of her line, and a female, she gave that name as a first name to her first-born son (my uncle), which made things rather uncomfortable for him when he went to visit Scotland! Anyway, thank you for sharing your stories - I find family stories fascinating! And I will definitely be looking up the "Two Little Savages" book! We have a couple different types of wild onion here, but no ramps unfortunately. We have a smaller type (3-4") that has a sharper garlic like flavor, I see these more in lawns. 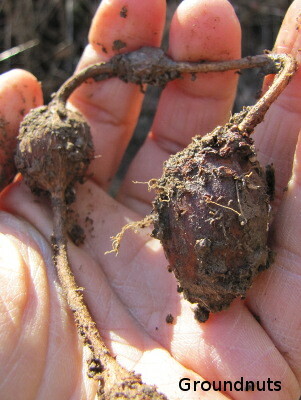 The prize we look for prefers creek bottoms, it gets ~1ft tall and the bulb half dollar size at the largest. They have a sweet flavor that reminds me of vidalias if you pick them before they flower. I'm thrilled to see so many fond wildcrafting experiences! I can't think why I didn't mention berries in my post --- I guess they don't even count as wildcrafting to me, I'm so used to them? Things I'd add into that category include nibbling on teaberry leaves (I think these are Mom's checkerberries, also known as wintergreen) and sassafras leaves. Probably other things too that I'm not able to think of on this hot afternoon. Mom --- I totally agree about Thoreau's anti-Irish snobbery. On the other hand, it kinda heartened me in an odd way. I can't imagine anyone being racist toward an Irish immigrant now, which makes me hopeful that all of our other racist tendencies will also dissolve into the mists of time. I found Thoreau's lack of wanting to eat his own beans odd too. I think he was too much of a philosopher and too little really interested in the farming experience. I've added "The Orchard" to my ever-lengthening to-read list. Ikwig --- Well, I'm not a historian, but I'll admit that Walden has been a trial to me!! We'll definitely go lighter next time around. Fascinating story about your family history, especially the Irish pejorative. Emma --- I think black raspberries are my favorite wild berry too. I haven't been sure what to say of wildcrafting. I haven't done much of it. I mean, sure I've added some plantain leaves to a hamburger when I had no lettuce, or opportunistically picked some wild berries, and I suppose sometimes I enjoy gathering some sassafras roots for tea. But aside from these, I'm very unaware of what I can wildcraft around here, particularly things I would go out of my way for. If I can be said to 'wildcraft' anything on a regular basis, it would be four-leaf clovers. Stick me in a clover patch, and I any time I look down, and they seem to look right back up. Somehow, it never loses its magic for me. I sometimes like to eat them to 'digest the luck'. But that's just whimsy, nothing one could call practical. Does wildcrafting for chicken food count? I just got 10 baby chicks this week --it's my first time raising chicks! After reading your post, I decided to go searching for some bugs, berries, seeds and leaves that they might like to eat, since they can't go outside on their own yet. I don't think they've actually eaten them, but they seem to have fun playing with blackberries. One chick will pick up a berry and run around, while the others chase and try to steal the berry, and then they become the one chased, and so on. Although part of me wonders if the berry might not infact be stuck on the beak, and being so new to it, the chick panics and has no idea what's happening, so it runs around, and the others see some strange thing on the beak of their panicked hatchmate and attack it. I like to believe it's the former, though! A quote I liked was "... but this is one of those sayings which men love to repeat whether they are true or not. such sayings themselves grow harder and adhere more firmly with age, and it would take many blows with a trowel to clean an old wiseacre of them." I always find this sort of thing interesting to think about; The ways we get ahold of ideas, and propagate them, and keep them around. Just after moving out here, I had no internet connection at first. It was awful! Every time I had a question about something, I had to ask someone. And usually I would get responses of this sort, hearsay passed along to someone by their neighbors or friends. I find it sort of disturbing that when I start wondering about the missing details, or wonder about ways to test what I've been told, or modify things, I seem to inadvertently offend the tellers. Do any of you others ever encounter this sort of issue? The note of Thoreau burning clam shells for lime plaster was interesting -- and it also makes me wonder, could you make lime plaster with burnt egg shells, then? I'm always interested in how things can be made, whether it's actually practical to do so or not. But limestone, seashells, and eggshells are all mostly calcium carbonate, I think. I've got Gaia's Garden, Coop, the Dirty Life, and The Bucolic Plague all around somewhere, I think. I havn't actually read any of them yet, save for flipping through Gaia's Garden a few times for ideas. As thought provoking as Thoreau has been, I'm definitely ready for a lighter read, too!